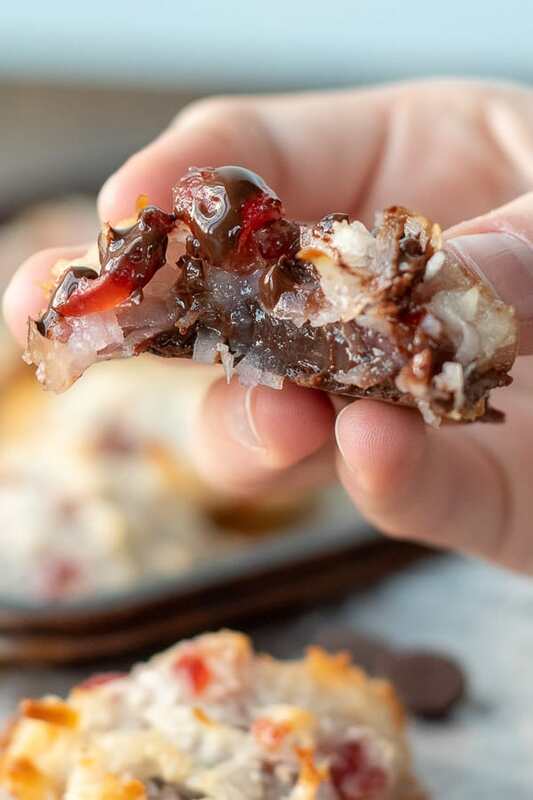 Easy Chocolate Coconut Macaroons takes the best coconut macaroon recipe and brings it to an insanely more delicious level! 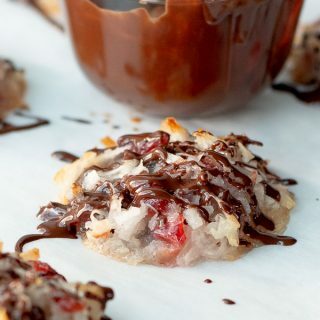 A chewy coconut cherry exterior wraps around a fudgy chocolate center and is drizzled with more chocolate. I’m like the Goldilocks of macaroon cookies and I’ve been on the search for the perfect Chocolate Coconut Macaroon. Every recipe I tried didn’t hit the mark. Too sweet. Too dry. Missing chocolate. Missing something. With all the macaroon recipes out there, why does the quintessential Chocolate Coconut Macaroon fail to exist? Something had to be done about it. 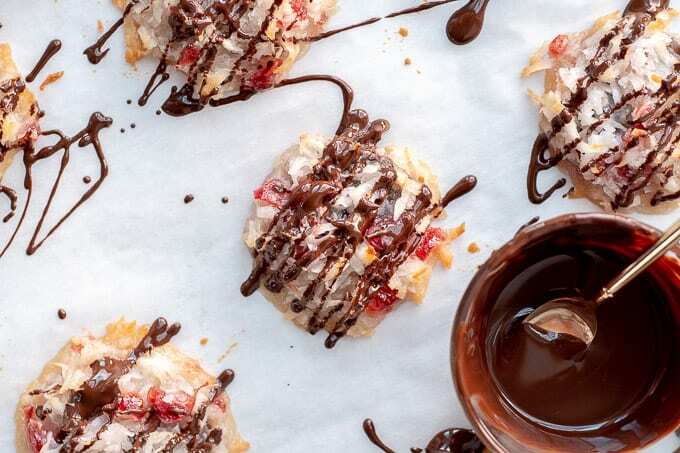 What Makes this Chocolate Coconut Macaroon Recipe the Best? There are more ways than one to skin a cat (totally gross expression 🥴), and more ways than one to make coconut macaroons. First, sweetened condensed milk is mixed with egg whites and coconut. Although this is a quick, easy recipe, I find the end result too syrupy and sweet. Alternatively, sugar replaces the sweetened condensed milk and is mixed with egg whites and coconut. This tames the sweet factor, but the dough is hard to work with and doesn’t hold together. 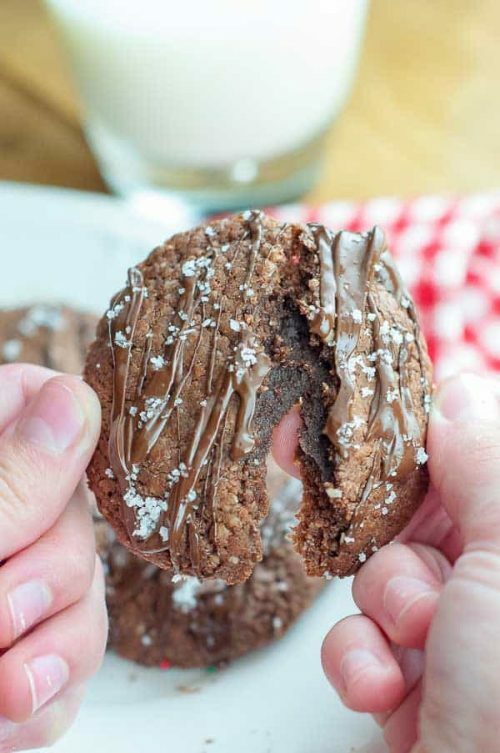 Chocolate Coconut Macaroons adds a couple tablespoons of flour, which gives the cookie more structure. Although this eliminates it from being naturally gluten free cookie, using a gluten free flour blend achieves flawless results. 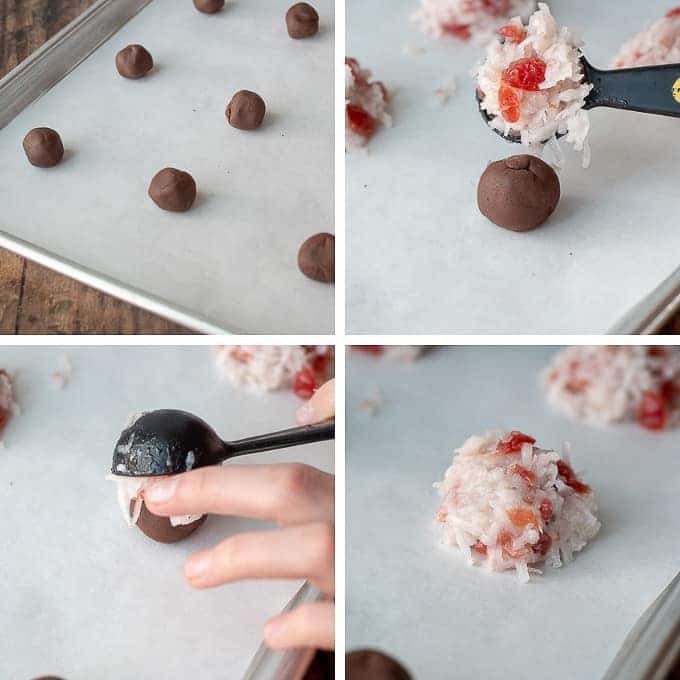 For holidays growing up, my mom always added chopped cherries to her coconut macaroons. I love the extra dimension of flavor and the added color makes them prettier for Valentine’s Day, Easter, or Christmas holidays. Generally I feel any dessert can be made better with chocolate (or even more chocolate). Since chocolate and coconut are magic together (HELLO, Almond Joy Cake), why not add a fudgy chocolate center AND drizzle more chocolate on top?! The fudge filling for these Chocolate Coconut Macaroons makes more than you need for this recipe. Therefore, I posted Easy Nutella Cookies to use the remaining fudge in. Now you can get a great start on your holiday baking with two cookie recipes! Use half of the fudge (see recipe card for suggested uses of leftover fudge or use in Easy Nutella Cookies) and cut into small squares. Shape squares into ball shape. Mix together coconut, sugar, salt, and flour. Beat egg whites until frothy with a fork. Add to coconut mixture with chopped cherries. Stir to combine. Place a heaping tablespoon over fudge ball and use fingers to cover and shape around. SAVE THESE CHOCOLATE COCONUT MACAROONS TO YOUR PINTEREST BOARD! 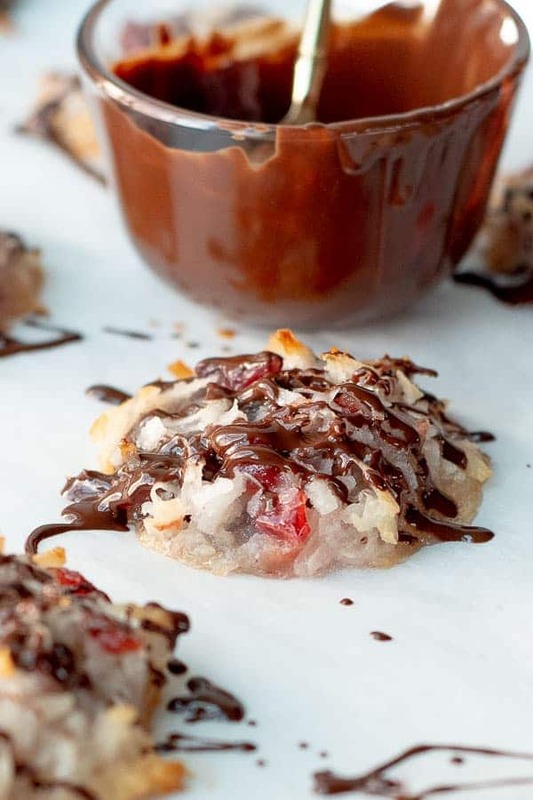 Easy Chocolate Coconut Macaroons has a chewy, coconut cherry exterior wrapped around a fudgy chocolate center and drizzled with more chocolate. Place sweetened condensed milk and chocolate chips in a saucepan. Heat over medium low until chocolate is melted and mixture is smooth. Pour into prepared pan and let set for at least 2 hours in refrigerator. Can store cooled fudge covered in fridge until ready to use. Preheat oven to 325ºF. Line two baking sheets with parchment paper. Take half of the prepared fudge (You will have fudge leftover. See Recipe Notes for leftover ideas.) and cut into 24 1" squares. Shape each square into a ball shape. Place fudge balls on the prepared baking sheets, placing about 2 inches apart. Push down slightly on the ball so it has a flat bottom and doesn't roll around. Set aside. 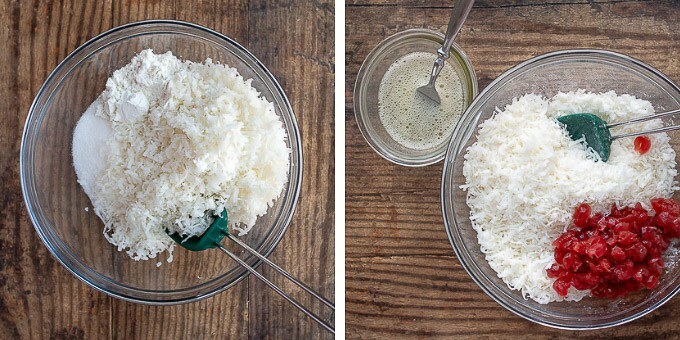 In a bowl combine the coconut, sugar, flour or gluten free flour, and salt. Add the egg whites, vanilla extract, and chopped cherries. Stir to combine. Bake for 25-30 minutes, rotating pans halfway. Cookies are done with coconut starts to brown and toast. Cool on baking sheets for 10 minutes, then transfer to wire rack to cool completely. Place chocolate chips and vegetable oil in a small microwave safe bowl. Heat on high until chocolate is melted and smooth, about 1 minute. Drizzle over baked cookies. Let chocolate set (can refrigerate to speed up process) before stacking and storing cookies. Leftover fudge can be sliced and enjoyed as is, frozen for future use in cookies, or stuffed inside Easy Nutella Cookies. Cooled cookies can be frozen up to 6 weeks in an airtight container or in gallon freezer bags in a single layer. 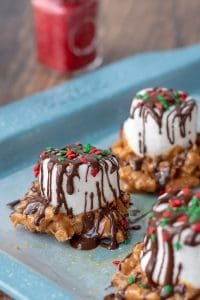 These cookies were an awesome treat over the holidays!! I ended up doubling the coconut mixture because I liked a little bigger macaroon. Super tasty! “Children have grave potential of squashing promising friendships..” hahahahaaa! This is so true and made me laugh. This lovely little dessert looks so yummy! 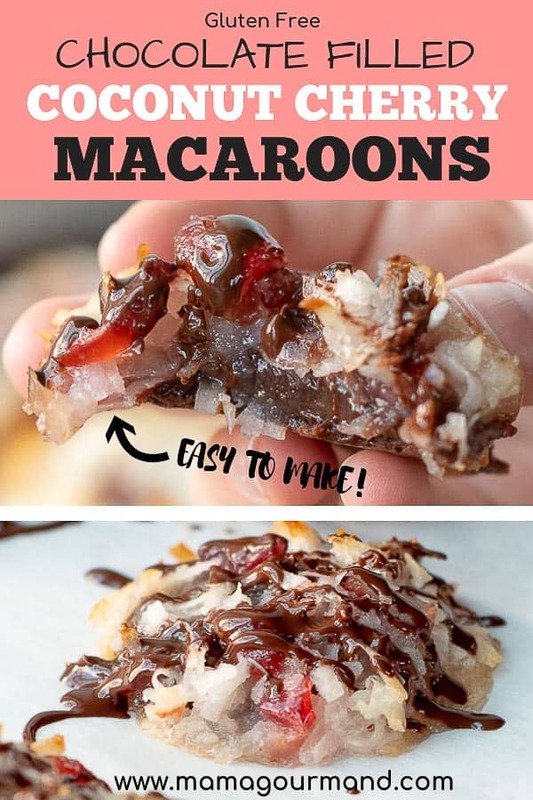 They look amazing, I love chocolate and I love coconut macaroons! Great minds think alike..Me too! Everything can be improved with chocolate.